This group of children have been specially chosen to act as role models and to have a positive impact in key stage one. 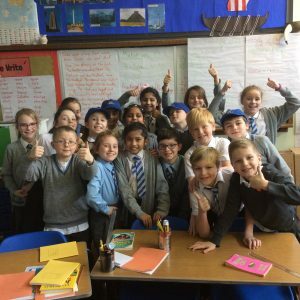 The group is made up of pupils from years 5 and 6 and their role is to encourage and organise activities specifically in KS1. The children organise activities and games such as: relays; ball skills; kick ball and encourage children to take part in these activities which will hopefully develop their basic skills and encourage participation. Additionally, these games are developed for enjoyment and getting children to collaborate. These children, made up of pupils from year 5 and 6 have two responsibilities. First, they organise collaborative play and second, they encourage all children to join in, specifically encouraging children who might not usually take part. The idea is that children are encouraged to play together and form friendships with others whom they might not normally associate. These children are also visible on the playgrounds so that if any child is feeling left out they can approach a ‘friend’ for support and a friendly ear. Both groups are trusted ambassadors for school and are role models for all around them. Here is a picture of some of the fabulous playground friends and leaders who operate in our school.